Alt az mount for guidescopes and telescopes. A perfect condition Skywatcher Dual-Speed 2" Low Profile Crayford Newtonian Focuser is on sale! Do not like the price?. Provides an exceptionally smooth focusing operation with the utmost precision, with the aid of its fine-focusing facility. 2 x DC 12V output car jack for travelling purpose. Car DC output DC 12V. DC 3, 6, 9V output jack. DC output 3V, 6V, 9V. Key Features. Key Specification. Kit Content. Ideal for use with Sky-Watcher SynScan and SupaTrak mountings. The motor drive is perfect for long-exposure astrophotography. The drive can be operated with Battery. 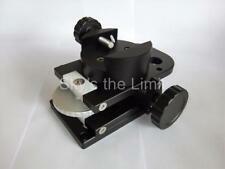 Exclusively designed for Skywatcher EQ5 equatorial mount. Design Skywatcher EQ5 Equatorial Mount. For Skywatcher EQ3-2 mount only (goto and non goto). Illuminator attaches on the mount on the opposite side of the polar scope eyepiece (push fit). Skywatcher 2" (50.8mm) H-beta CCD filter with case. UK seller. UK stock. Skywatcher 2" CCD H-Beta filter. Ideal for H-Beta objects such as the Horse head, California. Fits 2" connection only. The motor drive require 6V battery for operation that is available separetly. The motor drive is light in weight and user friendly designed for ultra fast application and operation. SkyWatcher Dual-Axis Motor Drive For EQ-5 Mount With Handset. Skywatcher (Helios) 1.25" 7mm Nirvana-ES eyepiece. Focal length 7mm. Fold down eye cup. 70 degree AFOV makes for a much more wide and. comfortable field of view compared to standard 50 degree plossls. For Skywatcher EQ3-2 mount only (GOTO or not GOTO). Polar illuminator not included. SkyWatcher 116 mm Tube Ring With Dovetail Adaptor. The rings are virtually new and the dovetail only has the usual usage marks from the locating screws. Skywatcher L-Bracket Dovetail. It is constructed from high quality aluminium for durability and persistent performance. The versatile L-Shaped Dovetail Bracket provides a horizontal mounting platform when used with vertical-arm Altazimuth mounts. Skywatcher 6x30 erect image finderscope. Erect image and correct left/right orientation for easier targeting of objects. The 90 degree angled design reduces neck strain when targeting high up objects. Sky-Watcher 'SP-Series' Super Plossl Eyepieces Available in 6.3mm, 7.5mm, 10mm, 12.5mm, 17mm, 20mm, 26mm, 32mm, and 40mm focal lengths. We will always help you to have a 100% positive happy buying experience. 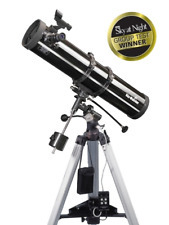 Buy Sky-Watcher Star Adventurer Counterweight Kit featuring Includes Shaft and 2.2lb Weight. 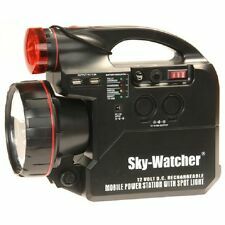 Review Sky-Watcher. Counterweight Shaft with End Screw. Up to 5 speeds can be selected in this mode (see below). Furthermore, the VirtuosoTM mount can be upgraded to Go-To by purchasing a SynscanTM AZ Go-To handset and cable, allowing 42,900 night sky objects to be automatically found from its extensive database. Its can be used in both Northern and Southern Hemispheres. HM5 Polarscope is usable in both Northern and Southern Hemispheres. Useful accessory designed for the EQ3-2 Equatorial Mount. Key Features -----------------------------------------------------. The Skywatcher EQ6 extension tube extends the height of the EQ6 mount. With the addition of the mount it is easier and more comfortable for the observer to view through a long refractor. The mount is installed between the tripod and the mount head and extends the height. It has both 1/4"-20 and 3.8"-16 tripod mounts to fit on most astronomical, photo or video tripods. • Built-in and Illuminated Polar Axis Scope. • Load Capacity: 5kg. Key Features. • Power Source: 4 x AA batteries, up to 72 hr and Mini-USB port for external power. Astronomy Binoculars. Red Dot Finder. Baby Photo Albums. Camcorder Case. Parabolic Primary Mirror. Remote & Cable Releases. Cokin Filter System. USB Flash Drive. Skywatcher 9x50 erect image finderscope with bracket Mounting shoe not included . The high quality 9x50 finderscope has such good optics, it makes a great wide field scope on its own. SkyWatcher 7-21mm Zoom Eyepiece is a lightweight, compact, durable zoom eyepiece which enable user to have maximum detail of the observe object. The high quality 7-21mm zoom eyepiece in 1.25" format. SkyWatcher Tripod Adaptor Plate is a lightweight and durable adapter that is designed for Skywatcher AZ3 mount. It feature a high quality material construction for durability and precise functionality. Star Discovery P150i Main Features. Red Dot Finder. Parabolic Set Primary Mirror. SynScan App Database: Total 10,000 Objects. (Unlimited objects when working with a 3rd party planetarium software). Skywatcher EQ5 Enhanced Dual Axis Motor Drives. Design: Skywatcher EQ5 Equatorial Mount. The motor drive runs on 4 "D" cell batteries (not included). 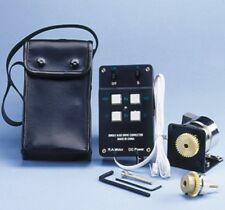 The enhanced handset has an ST4 interface for an Auto-Guider, such as Sky-Watcher’s Synguider. The new NIRVANA-ES™ 7mm UWA-82° High-Performance Eyepiece provide you with an excellent viewing experience. Featuring a blackened lens edges with fully multi coated optics to avoid reflections. NIRVANA-ES™ 16mm UWA-82° High-Performance Eyepiece. 45mm Sky-Watcher/Vixen type dovetail saddle. SynScan App Database: Total 10,000 Objects. (Unlimited objects when working with a 3rd party planetarium software). Weighing only 1.3kg, the AZ-GTi is now available as a mount head only, and can be connected to a tripod via its standard 3/8" tripod bush. Red Dot Finder. 45º Erect Image Diagonal 1.25"/31.7mm. We will always help you to have a 100% positive happy buying experience. Magnifications (with eyepieces supplied): x24 & x60. 38% more Light Gathering than 102mm. The Star Adventurer Mini is easy to utilise in all of its modes. featuring a system that can be fit to any standard tripod having ¼” or 3/8” adaptors. By adjusting the tilt of your tripod head you can easily set the latitude, or you can use the Equatorial Wedge for more accuracy. It can produce near-photographic views of the Veil, Ring, Dumbbell, Orion, plus many other nebulae under dark skies. 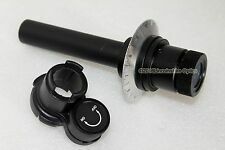 These Available in two sizes, threaded to fit either standard 1.25” or 2” astronomical eyepieces. Counterweight 5.1 kg for Skywatcher, Celestron, Vixen Mounts. counterweight for all common mounts from Vixen, Skywatcher, Celestron, iOptron. with D=20 mm counterweight shaft. Skywatcher: EQ3, EQ4 and EQ5. 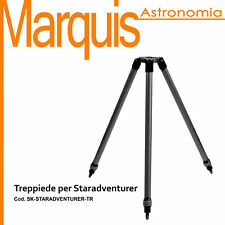 SkyWatcher Equatorial Wedge For Star Adventurer Black/White. SkyWatcher Equatorial Wedge For Star Adventurer Black/White. SkyWatcher Equatorial Wedge. Kit Content. Optical Vision Variable polarising Filter Set For Telescope: 1.25"
The Variable Polarising Filter is a high quality anodized aluminium, optical glass variable polarising filter designed to reduce the amount of light entering your eyepiece. The light transmission can be varied from 40% down to as little as 1%. The erecting eyepiece can be used on any refractor, even a short-tube. It works alone without a diagonal. The extension tube is needed only when focus can not be reached by using the erecting eyepiece alone. SkyWatcher Star Adventure Astro-Imaging Mount With Autoguider Interface White/Black. SkyWatcher Star Adventure Astro-Imaging Mount. Red laser collimation beam with 7 brightness levels. Removable 2" adapter. We will always help you to have a 100% positive happy buying experience. Condition - New. CR2032 Lithium Cell battery (included).